500 words from is an occasional series in which novelists talk about their new novels. 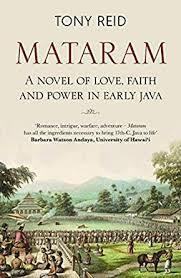 Tony Reid has recently brought out Mataram: a novel of love, faith and power in early Java. Tony Reid is better known as Anthony Reid, author of ten non-fiction historical works on Southeast Asia, including the much-read and translated Southeast Asia in the Age of Commerce, c.1450-1680. He has taught Southeast Asian history at universities in the US (Yale, UCLA, Hawaii) and Australia (ANU), as well as Malaysia, Indonesia and Singapore. He now lives in Canberra, Australia. Mataram is his first work of fiction. Mataram follows the story of Englishman Thomas Hodges, after he seizes a chance at glory by being the first to venture ashore from his East India Company ship when it arrives in Java. Will he find success, or die forgotten with some Javanese kris or Portuguese poignard between his ribs? The key seems to lie with his captivating female interpreter Sri, but he can only keep both her and his Englishness by inventing a mission from King James to the mysterious great ruler of the interior, in the region known as Mataram. In Mataram, Thomas and Sri find a kingdom poised to decide its destiny. A rich Hindu-Buddhist past of gods and spirits now confronts a sterner Islam, and pushy Europeans offering both science and God. For Hodges and Sri, survival alone will be a challenge, reconciling survival and desire with conscience in this mysterious spiritual landscape, impossible. Does everybody, or at least everybody who reads novels, ponder whether they could write one themselves? I certainly had been pondering it for several decades before I seemed to have the leisure, or was it the desperation, to get seriously into it. My day job has long been as an historian of Southeast Asia, so it’s not a big jump to historical fiction. Just add an attractive couple and their romance, and stir -right? Then why has it taken nearly a quarter-century since I wrote what was meant to be the first sentence? The lightbulb moment that got me started on the Mataram idea was reading James Clavell’s Shogun 40 years ago. That made it look easy. Pick an exotic locale, as historically accurate as possible, and then produce some foreign, preferably English, eyes to provide the vantage point on that world. There were plenty of models in my field. The first generation of European explorers of the Indies - Portuguese in the early 16th century, English and Dutch in the early 17th - wrote in lively wonder of what they found. But historians just don’t know how to write novels. Learning the art of dialogue, and the management of suspense, and how to produce a dramatic denouement are all challenging enough. But we are also handicapped by a lifetime of negotiating that fine line between fact and creativity according to one exacting craft, and then playing it again by different rules. As learning experiences go, it was a lot of fun. I fell in love with my fictional characters - an opportunistic English East India Company servant, a Cornish Jesuit, and a multilingual, confident and, of course gorgeous, Javanese lady of Banten. Their journey became my journey; their humiliations and triumphs became mine; I wept when they died. Language was a major issue, as it is still today for somebody like myself coping with Indonesia as a research field. My Englishmen had to learn first Malay, the lingua franca of trade (ancestor of the national languages of Indonesia and Malaysia), then Javanese as the only language spoken in the interior. Meanwhile they operated in Portuguese, which had become in the 16th century another lingua franca for dealing with Europeans and many Indians, Arabs and Japanese. Moving between fluency in one language and stumbling incoherence in another was necessarily part of the journey. Once my man Hodges got off his ship, the Red Dragon, he had to leave his English behind. Without being heavy-handed, I had to hope that readers understood that his relative ease in Portuguese was rendered as English, while the new languages retained much of their strangeness. The early 1600s, when the novel is set, was a time of crisis as well as opportunity for Java. International Muslims, Chinese, Portuguese, Dutch and English not only brought new wealth, ideas and technology as they contended for the pepper and spices of the Indies. Each also brought their own conflicting ideas of the cosmos. The Javanese fortunately were accustomed to embracing plural ideas, convinced that outer difference cloaked an inner ultimate truth. Like many today, what they found difficult was coping with the newcomers’ idea that only one such idea could be right. Details: Mataram is published in paperback and eBook by Monsoon Books. Priced in local currencies.